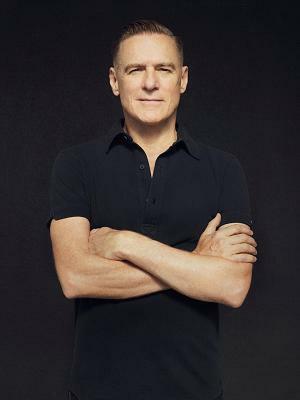 From the moment of his birth in Kingston, Ontario in 1959, Bryan Adams was destined to travel. The son of a Canadian foreign service diplomat, Adams' peripatetic childhood meandered from Lisbon to Vienna to Tel Aviv before returning briefly to Ottawa and finally putting down roots in Vancouver in 1974. A confessed "club rat," Adams tore into the local music scene with zeal, sneaking into venues to catch James Brown and Tina Turner. He quit school, took over vocal duties with glam rockers Sweeny Todd and began an ongoing prolific song writing collaboration with Prism drummer, Jim Vallance. In 1978, a demo tape snagged a contract with A&M Records. Two years later, his eponymous debut established him in Canada. Adams' signature catchy pop hooks and yearning power ballads gelled on his third outing, 1983's Cuts Like a Knife. Laden with hits like Run to You, Heaven and It's Only Love, Reckless (1984) burst mainstream's seams vaulting Adams into international superstar status. Adams commanded a formidable presence on the single and album charts through the mid 1990s after which his popularity began to wane in the US. His Canadian audience remains solid and he is still a huge draw in Europe. His innumerable hits are staples on classic rock radio stations. During a career stretching now to 4 decades, Adams has sold 65 million recordings of his 14 studio albums to a fan base that is as far flung as his tours of North America, Europe, the Far East and Asia where he was one of the first major acts to perform in India, Pakistan and Nepal. In 2008, he was ranked 38th on the list of all-time top artists on the Billboard Hot 100, 50th Anniversary Charts. Adams is the winner of a Grammy and 20 Junos, as well as Grammy and Golden Globe nominations for his song writing for film. He is the recipient of the Order of Canada, the Governor General's Performing Arts Award (2010) and is a member of the Canadian Music Hall of Fame (2006). He co-wrote the song Bang the Drum and sang it as a duet with Nelly Furtado at the opening ceremonies for the 2010 Vancouver Winter Olympic Games. Pretty Woman, with music and lyrics co-written with Jim Vallance, began its Broadway run in August of 2018. Adams is also a long-time vegan, an award-winning photographer, a philanthropist through his foundation to improve educational opportunities for young people around the world and an activist for animal rights. Among rock's most unassuming stars, Adams is an unabashed romantic (Canadian, eh!). With a repertoire that leans heavily on sentimental love songs, critics haven't always lavished it with the respect that it deserves. But honestly, is there a more piercing depiction of failed love than "Cuts Like a Knife, "a finer homage to teenage hormones meet musical angst than "Kids Wanna Rock," a more profound paean to adoration than Everything I Do (I Do It for You)," a more contrite apology than "Please Forgive Me," or a stronger contender for the ultimate rock anthem than "Summer of '69"? Musically, Adams is as sincere as sincerity gets. His voice, a seductive coupling of burlap and honey that is one of rock's great instruments, delivers "straight from the heart."